This development has led to numerous employment opportunities for foreign nationals working in skilled and specialized roles in the country. Accordingly, the sectors in India that attract the largest number of foreign professionals are administrative roles in the construction and engineering, followed by telecommunications and IT, and financial services. 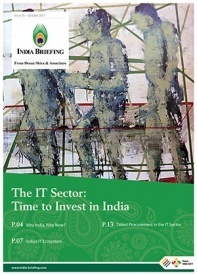 As greater foreign funding has resulted in hiring of foreign expertise, India’s living and working environments have also adapted to global cultural standards. This is particularly so in its tier-1 metropolitan cities, where Special Economic Zones, industrial and software parks, as well as corporate centers have created conditions conducive to new jobs with an international profile. 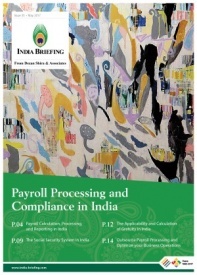 Here we discuss India’s living and working environment, and briefly touch on its HR and payroll laws as applicable to foreign nationals working in the country. Expatriates first in-country encounter with Indian bureaucracy often occurs at the Foreign Regional Registration Office (FRRO). Copy of employment contract and undertakings by the employer. All documents, with an exception for the Incorporation Certificate, must be original copies, drafted on company letterhead, signed by a senior manager, and marked with the company’s official stamp. Once the FRRO is satisfied with the above documents, a “residential permit” to stay in India is issued to the foreign national. In India, the workplace set up is often hierarchical with clear boundaries between management levels. The country’s business etiquette is a combination of Western and Eastern practices, but local customs do permeate relationships. These need to be acknowledged for successful business interactions. 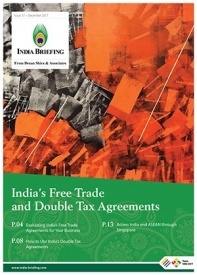 Appealing to a person’s honor and being respectful of each other’s roles and expertise is also important when beginning a discussion or conducting business with an Indian colleague or associate. 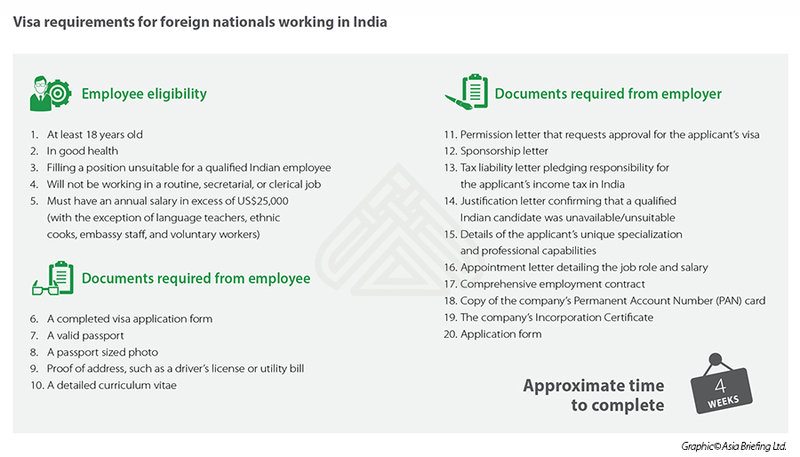 A country-wise break-up is not available for foreign nationals working in India (excluding people from neighboring countries settled as refugees or economic migrants). 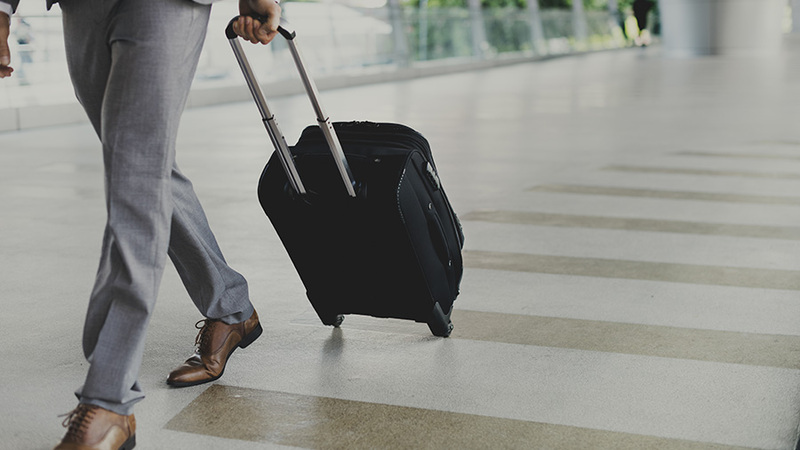 The high minimum salary threshold set by the Indian government at US$25,000 (salary and allowances) for foreigners seeking an employment visa effectively ensures their small population to high-ranking and specialized positions. However, this minimum wage rule does not apply to foreigners employed as language teachers and translators, ethnic cooks, embassy staff, and academics in central higher education institutions. India’s general level of safety varies. Generally, expats will not be exposed to violent crimes but they should keep guard against instances of petty crime, pickpocketing, and small scams. Women should be cautious when traveling alone, especially at night. India does face the threat of terrorism and foreigners will find that security checks are robust in the country’s major cities, particularly at government buildings, hotels, sports venues, malls and shopping centers, transport centers, and places of worship. 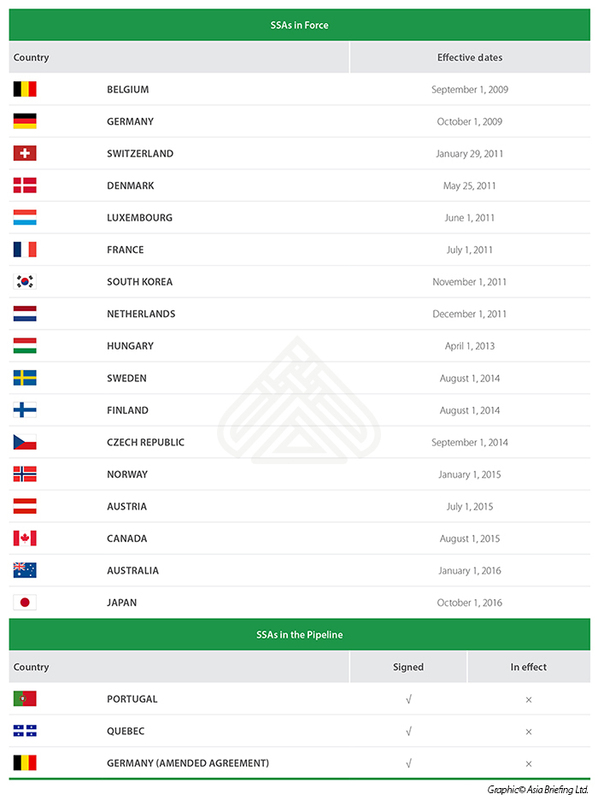 Most expatriate families send their children to private or international schools. The curricula, learning environments, teaching philosophies, and fees in these institutions vary widely, and parents must choose a school that aligns with their budget and expectations. International school fees are among the most expensive, and foreign hires should ensure that they have a sizeable allowance in the employment package to accommodate this. Public hospitals in India often employ well-trained English-speaking doctors and nurses. However, a lack of equipment, funds, staff, and overcrowding means locals and expats opt for private care whenever possible. 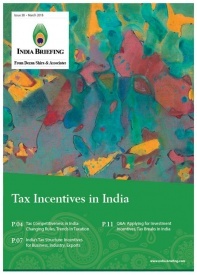 All expats moving to India should ensure that they have adequate health insurance coverage. 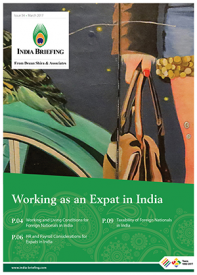 Most locals hire household help – such as cooks, cleaners, and drivers – in India but expats need to consider several factors. These include finding the right source – local agencies, which may operate illegally and provide only native-speaking staff; expat-focused domestic staff agencies like Domesteq; and international groups. 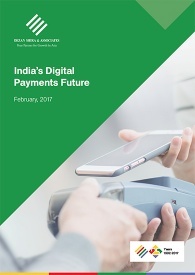 Due to the high supply of labor in India, there will be abundant local references – here language skills and identity verification become important considerations. Domestic workers may be part-time, full-time, and live-in. When hiring domestic staff, expats should verify their background and identity, either via the recruiting agency or intermediary or by registering with the local police station. India’s social security system provides pension and retirement benefits to workers in factories and ‘covered establishments’ – defined as establishments employing 20 or more employees. The system is governed by the Employees Provident Fund and Miscellaneous Provisions Act, 1952 (PF Act). An Indian employee who worked or is going to work in a foreign country with which India has entered into a social security agreement (SSA) and is eligible to avail the benefits under the social security program of that country. An employee other than an Indian employee, holding other than an Indian Passport, and working for an Indian covered establishment. Excluded Employee is a “detached worker” employed in India, but contributing to the social security scheme of his/her source country, according to the provisions of a social security agreement (SSA) between the home country and India. Detached Worker is an International Worker, not being an Indian employee, contributing to the social security scheme of the source country via the provisions of a social security agreement signed between the home country and India. Such a person is exempted from contributing to the Indian system for the period. Scheme. An IW who has joined on or after September 1, 2014 with monthly salary in excess of US$250 (Rs 15,000) is not required to be a member of the Pension Scheme. The cumulative employee and employer contribution of 24 percent of the monthly salary will be go to the Provident Fund. IWs can claim their Provident Fund upon termination of employment in India. 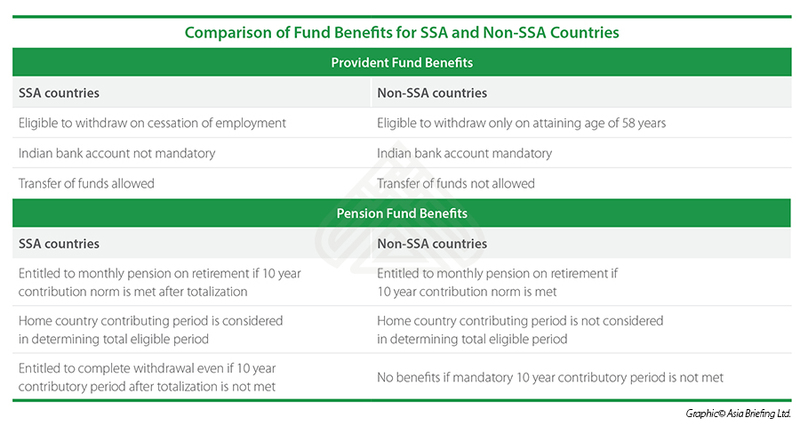 To determine eligibility, countries with whom India has an SSA have different conditions with respect to countries with whom there are no agreements. 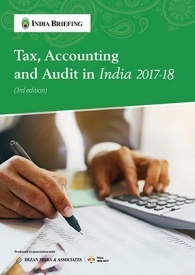 The “totalization of period” clause in an SSA allows the period of coverage in India and the period of coverage in the other country’s social security scheme to be aggregated in order to determine eligibility for pension benefits. Restrictive clauses such as non-compete, non-solicitation, confidentiality of information, and trade secrets.